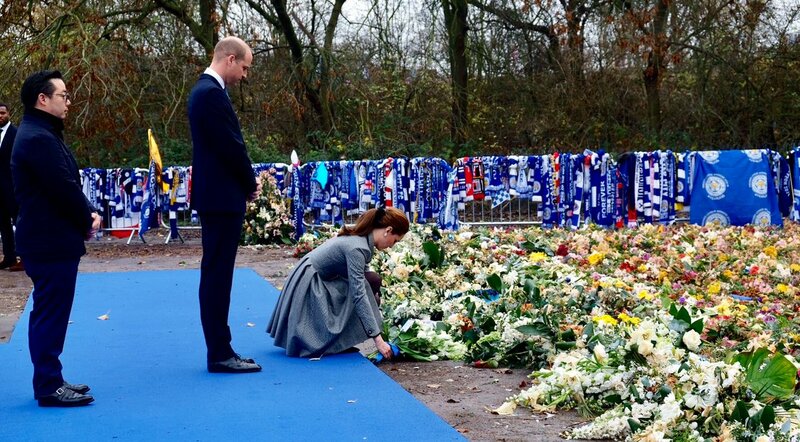 Today the Duke and Duchess of Cambridge, William and Catherine, visited Leicester city for a day of engagement to pay tribute to those who were tragically killed in the helicopter crash at Leicester City Football Club’s King Power Stadium. 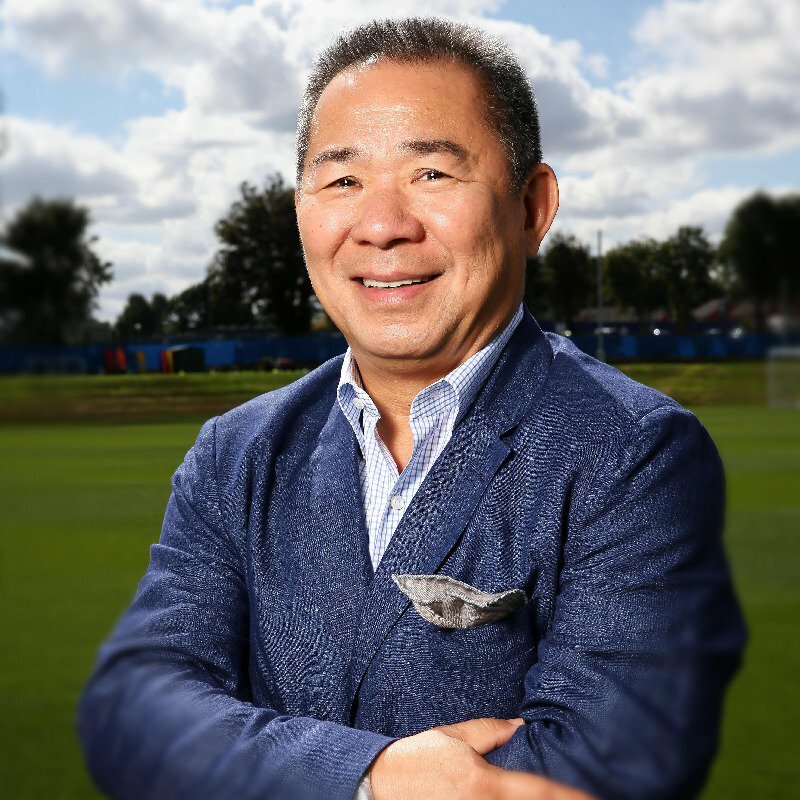 The Club chairman Vichai Srivaddhanaprabha , two members of Mr Vichai’s staff – Kaveporn Punpare and Nusara Suknamai, pilot Eric Swaffer and his partner Izabela Roza Lechowicz were killed on October 27 this year when his helicopter crashed just after lifting off from the pitch at King Power Stadium. Mr.Vichai bought the club in 2010. William and Catherine with Mr. Vichai’s son Aiyawatt, who is lovingly known as ‘Top’. William, in a statement issued by Kensington Palace shortly following the incident, described the late president as a man “dedicated to his family” and said he was lucky to have known Mr Vichai for several years. The charismatic Thai businessman had become a beloved figure in the club and the city. More than 5000 people walk from the city centre to the stadium to pay tribute to the late owner before the Premier League match against Burnley on November 10 when the club play at their King Power Stadium for the first time since his death in a helicopter crash. 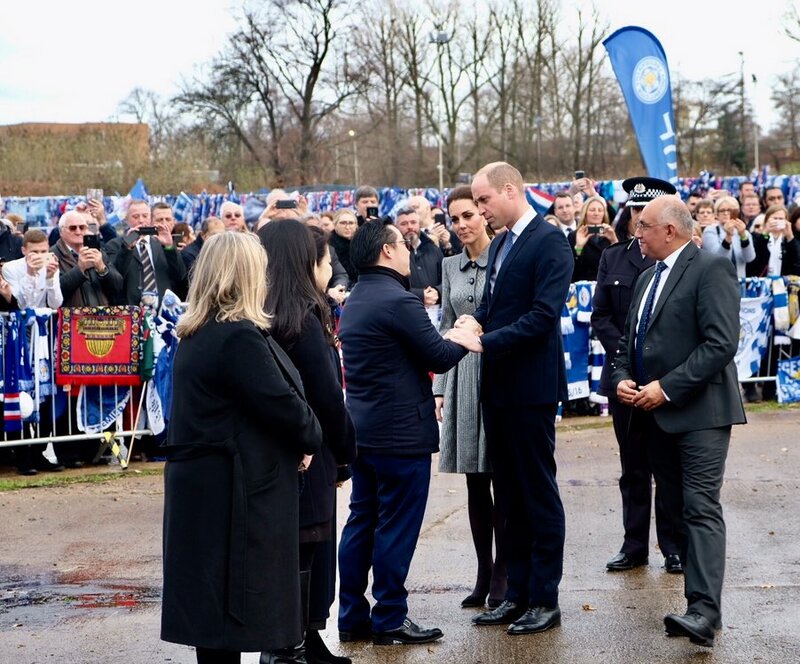 Upon arrival they were welcomed to the tribute site by Vichai Srivaddhanaprabha’s, widow, Aimon, his son and Vice Chairman of the Club Aiyawatt, known as “Top” and daughter Aroonroong. A video of the arrival shared by Rebecca English on Twitter. In the city, couple visited the tribute site near the stadium to pay their respects to those killed in the accident. 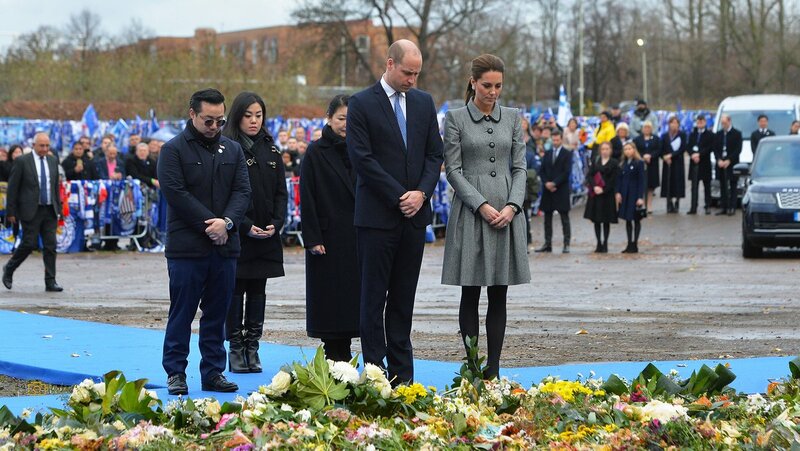 Duchess laid flowers at the site. There were hundreds of more flowers laid by the well wishers in the memory of the departed souls. 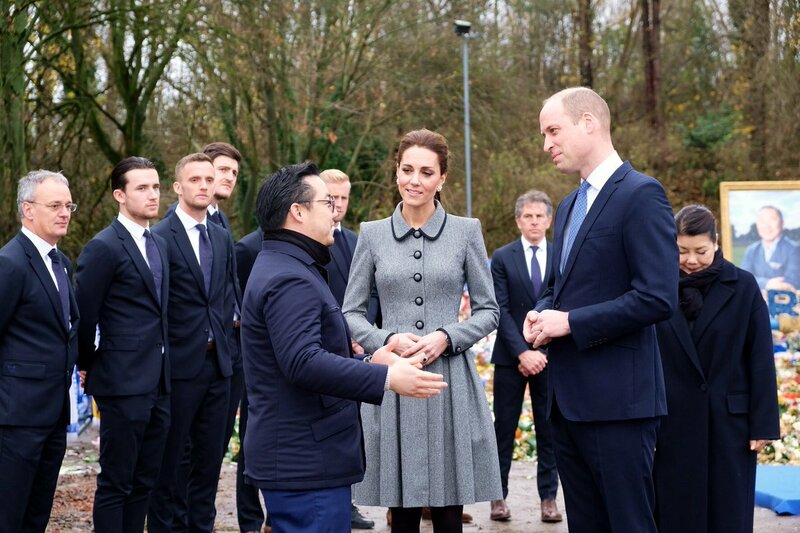 Speaking about the visit, Leicester City Vice Chairman Aiyawatt Srivaddhanaprabha and son of the late Chairman Vichai Srivaddhanaprabha said, “It is truly an honour for everyone associated with the Club to welcome The Duke and Duchess of Cambridge to King Power Stadium. For Their Royal Highnesses to visit the city to pay their respects personally is a remarkable gesture of compassion to the families of those who lost their lives, to the staff and players of the Club and to the people of the city whose lives were touched by my father. 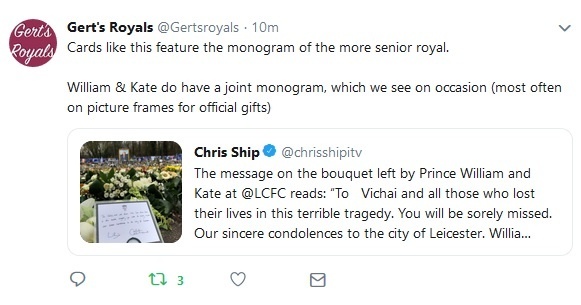 An interesting observation from Gert’s Royals on twitter. They met with Club staff and volunteers who helped to relocate the thousands of tributes which were left outside the stadium following the accident. The couple was introduced to the members of the Club’s management team and playing squad of Leicester City Football Club. A video of the tribute shared by the Sun. 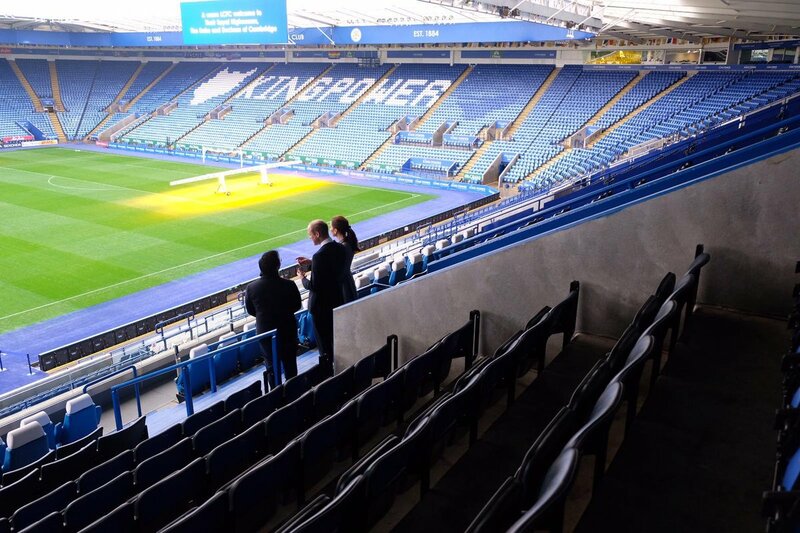 Next they visited the King Power Stadium, where they met with representatives from local charities that were supported by Mr. Vichai. 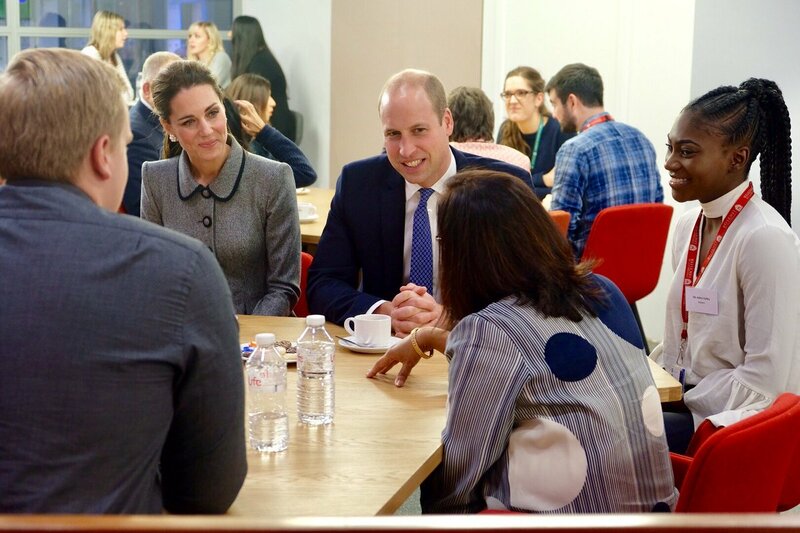 William and Catherine heard how his support enabled the charities to improve the lives of people in the wider Leicester community. It was couple’s first visit to the stadium. 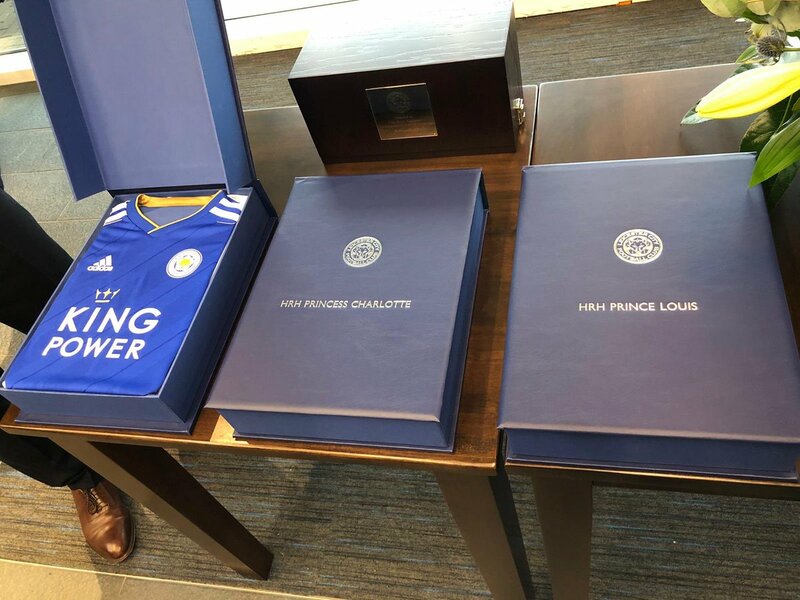 William and Catherine were presented with LCFC kits for George, Charlotte and Louis. Embed from Getty ImagesDuchess gave a warm hug to Khun Aroonroong, daughter of Mr. Vichai. 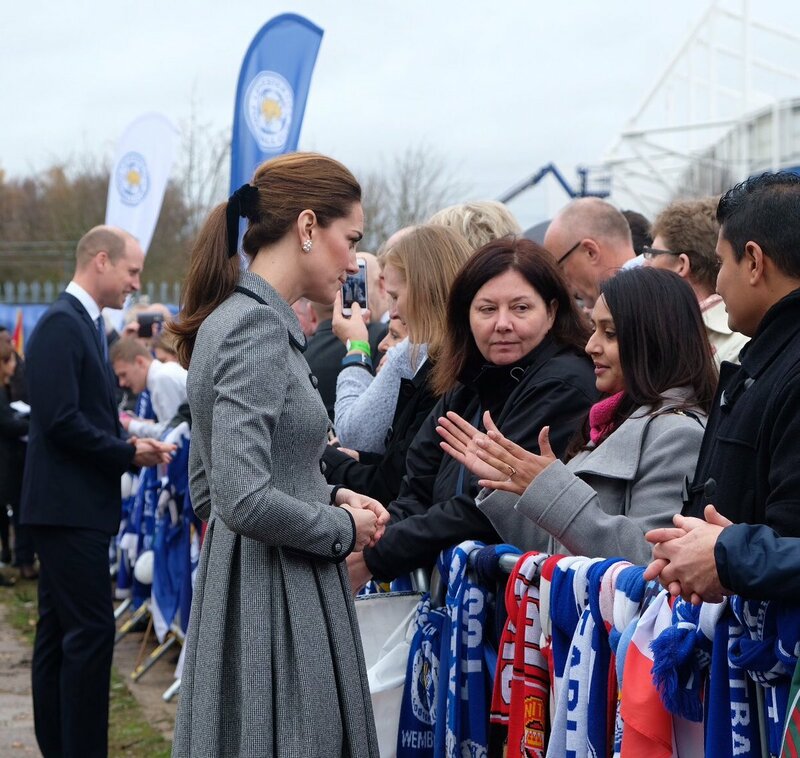 Following the stadium visit, The Duke and Duchess’ next stop was the University of Leicester to hear about some of the educational programmes that Leicester City Football Club has helped to support. They were welcomed by two cute twin brothers Sai and Taran Gokani with a kiss for Duchess. The visit is also important to William as his mother Princess of Wales, Lady Diana, also visited the university in 1997. 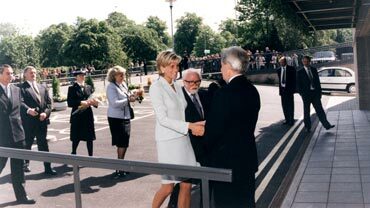 At the invitation of Lord Attenborough, Princess Diana visited the University in May 1997 to open what was then called the Richard Attenborough Centre for Disability and the Arts (now the Attenborough Arts Centre). The University has a close relationship with the football club. In May 2018 a £1M donation was made by Mr. Vichai, which will be used to help fund medical research about life-threatening diseases and training at the University through a Professorship in Child Health. 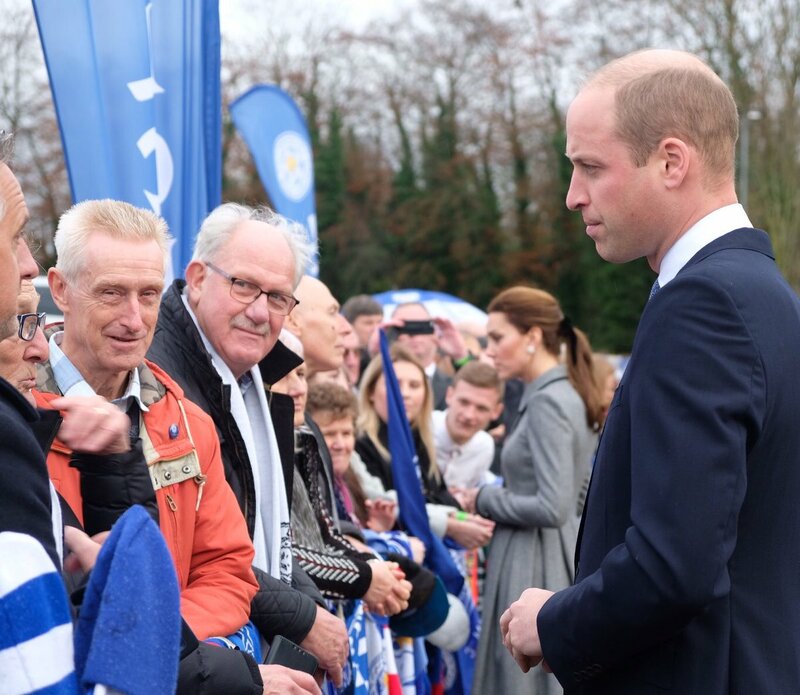 William and Catherine were shown three community projects, all reflecting the close ties between the University and Leicester City FC that Includes Professorship in Child Health, Heartwize and Leicester City Science Stars. The Leicester City Football Club Professorship in Child Health is a newly created post, funded through a £1 million donation by the late Vichai Srivaddhanaprabha, Chairman of Leicester City FC, earlier this year. The Royal Couple will meet the newly appointed holder of the post. Heartwize is a CPR training programme, begun in Leicester and now being rolled out nationally, supplying defibrillators and CPR training to school and the community. The Duke and Duchess will meet co-directors Dr William Toff and Dr Doug Skehan and programme co-ordinator Julie Young. Leicester City Science Stars is a new education programme developed as part of the Premier League Primary Stars programme, led by LCFC Community Trust. The couple will meet Associate Professor in Space Physics Dr Suzie Imber, who helped to launch the programme earlier this year. 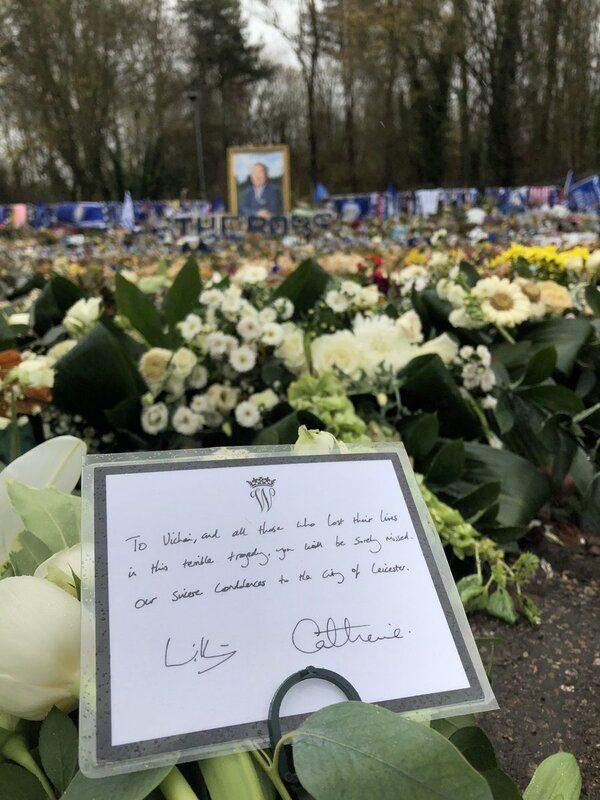 Catherine and I wanted to visit Leicester to pay tribute to a man that we knew, Vichai Srivaddhanaprabha and those who died alongside him in October. We knew Vichai as a man who cared deeply about his family and also his community. He of course was a man of wealth, but that wealth did not leave him disconnected from those around him. He believed in giving back. Catherine and I also wanted to come to Leicester because of what the people of this city, and fans of this club, have shown us all over the last few weeks. In 2016, this football club did something that should have been impossible. Against odds that are now the stuff of legend, you took on the Goliaths and superstars of the world’s most famous football league. In powering past them all to win the title, you wrote the best underdog story in the history of modern sport. And when the man that led this club to victory died so tragically, the people of this city revealed with their outpouring of admiration, that they too shared much of the character that was so central to who Vichai was. In a time when our football clubs have become huge global enterprises, you came out to thank Vichai for making the fans the true owners of this club. And you thanked him for investing the rewards of success in the future of Leicester City. You showed that community mattered to him and to you all. You showed us that the losses experienced by other families need to be felt keenly by our own. You were paying tribute to Vichai, Kaveporn, Nusara, Izabela, and a man I had the privilege to fly with in the past, Eric Swaffer. But you were also paying tribute to the fact that sport – when played with passion, but also with humility and respect – can bring us all together. Thank you for the example you have provided us. And thank you for welcoming us here today. 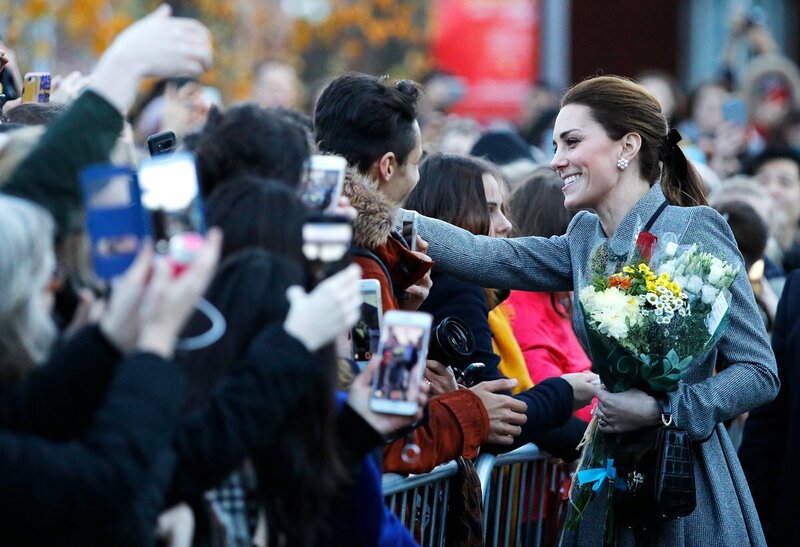 The royal couple learned about the University’s unique legacy as they visited the living memorial to those who made sacrifices during the First World War Centenary Square. Before leaving they met with the excited crowd that was waiting for them at the Unviersity. 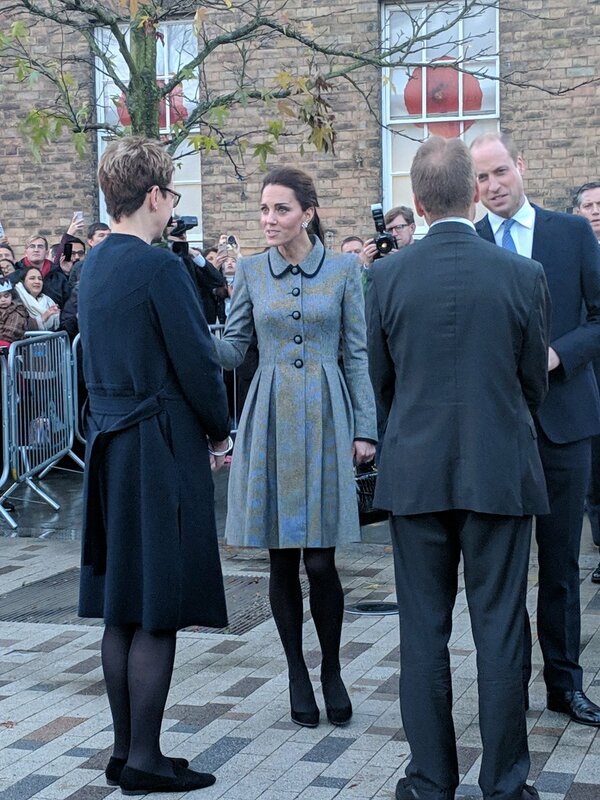 For the Day Duchess wore the same gray Catherine Walker Coat she wore during a Church Service earlier this year in August. The coat features soft Peter pan collars, button detailing at the front with Princess seam and pleated skirt. The outfit has a contrast trimming of black at the collars, cuffs and buttons. Catherine paired the outfit with a new Aspinal of London Handbag. She was carrying Midi Mayfair Bag in deep shine black croc. 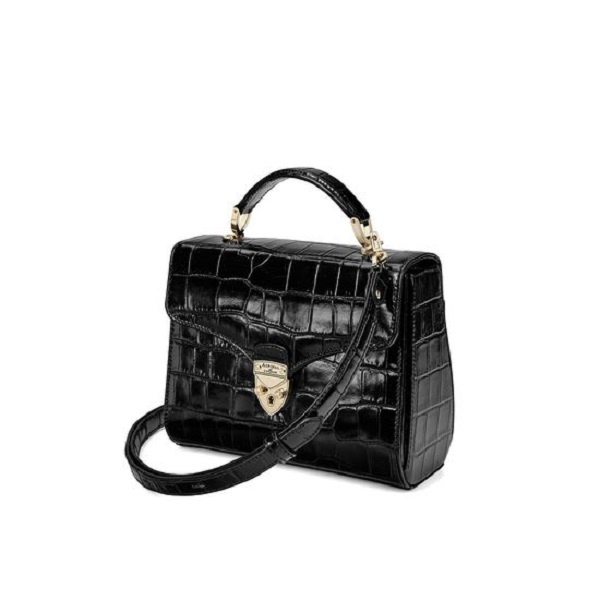 The $725 bag is described as, “Encapsulating timeless vintage-inspired styling, our Midi Mayfair Bag is hand-crafted from the finest deep shine black croc print Italian calf leather. Both versatile and luxurious, the structured boxy design features three inner compartments secured with our enduring shield lock clasp. What’s more, sumptuous black leather complements any outfit, and makes an exquisite transitional piece from day to night. 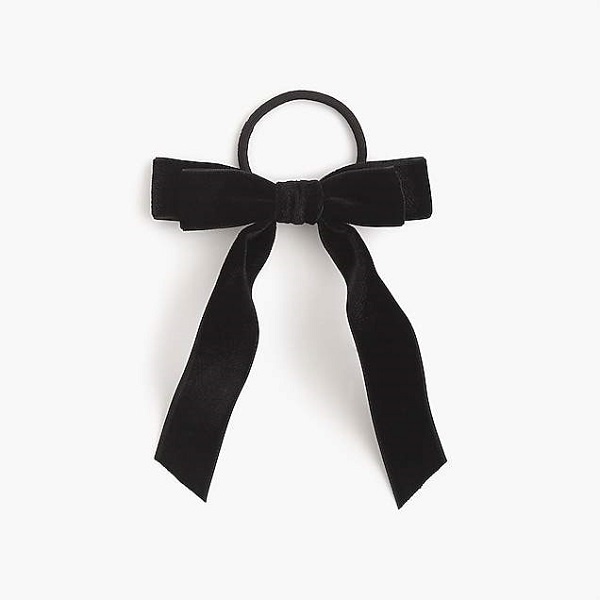 The flawless finish of the leather’s rich, glassy shine and the shimmering grosgrain lining give this accessory a truly elegant feel. With a convenient top handle and detachable strap, our Midi Mayfair is practical for when you’re on the go, featuring optional cross-body styling”. Personalisation of the bag with four initials or a name of up to eight characters is also available. She was wearing her black Tod’s block heel Suede Pumps that were seen first time in 2017 at a surprise visit to see off children at Paddington Station. 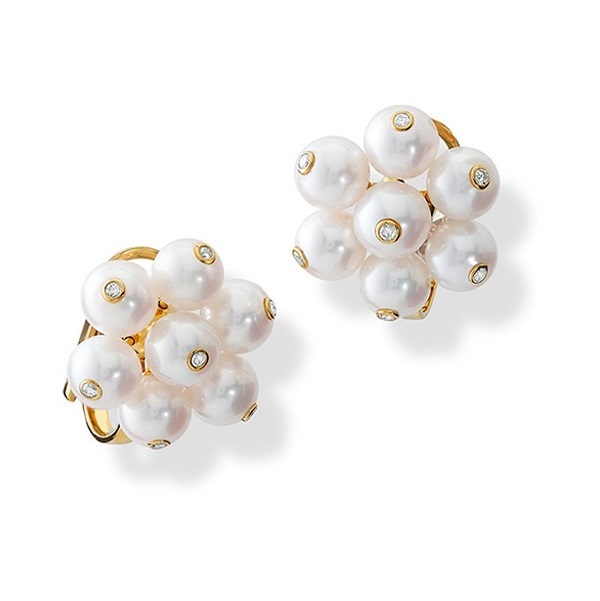 She finished her look with Cassandra Goad Cavolfiore Pearl Studs that we first saw at the christening of Prince Louis in July this year. She was also wearing herCartier Ballon Bleu watch that is believed to be a wedding anniversary gift from Prince William in 2014. 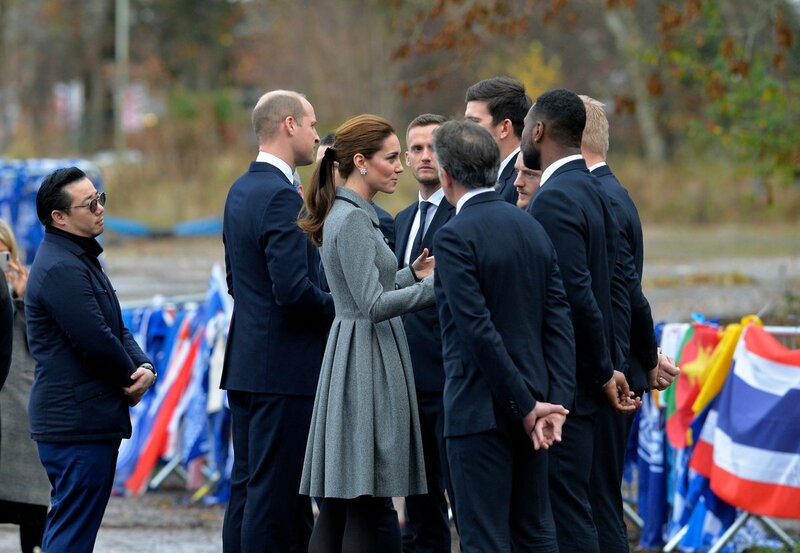 Duchess had her hairs pulled in a ponytail with J.Crew Velvet Hair Tie that we first saw last week during UCL visit.